Last week saw the ruling from Mrs Justice Lang to the judicial review challenge from the RSPB and Dr Mark Avery (the claimants) on the lawfulness of Natural England’s (NE) plan to begin a research trial for the active brood management of Hen Harrier in England. In summary, despite closely presented legal arguments the challenges from the claimants were rejected and Natural England would appear to be free to initiate the trials if nesting attempts in the coming breeding season allow. A request has been made already by Mark Avery for permission to appeal the decision and at the time of writing this is being considered. We await the outcome with interest. Meanwhile the recent ruling is worthy of examination in some detail. Members of the Northern England Raptor Forum have considerable experience of Hen Harriers in the field and indeed make significant contributions to their monitoring, protection and conservation. 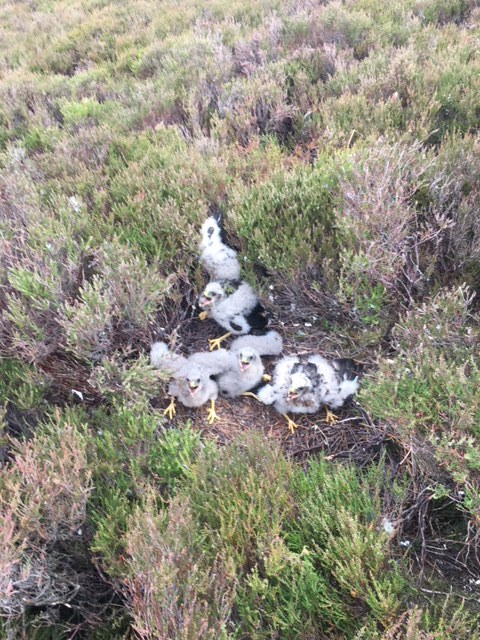 A brood of Hen Harriers managed by the parent birds. What is documented and agreed without challenge in the ruling is that the main threat to the conservation of Hen Harriers is the unlawful persecution by those associated with the grouse moor industry. Indeed this comes from Natural England’s own published research. NERF accepts that the purpose of Mrs Justice Lang’s review was necessarily limited to assessing the legality of the process by which Natural England arrived at their decision to grant a brood management trial. This narrow outlook did not allow the wider picture of persecution to be addressed in any consequential way. Justice Lang herself remarked that it was not the court’s role to adjudicate on matters such as the alternatives of diversionary feeding, criminal sanction, law enforcement, compensation or the licensing of grouse shoots. The lay person may find it perverse that the legal process and Natural England themselves appear to acknowledge and yet tolerate illegality whilst at the same time NE are investing effort and expense at interfering with the nests of rare breeding birds. It seems all the more illogical that affected nests may well be on Special Protected Areas (SPA) which are designated in part for the protection and conservation of Hen Harriers. To investigate the effect of brood management on the perceptions and behaviour of the moorland community (described as ‘social science’). Assessing whether conflict and persecution will reduce. To test the practicality of brood management in artificially rearing young birds (eggs or young being taken from the nest), releasing them back into the wild and seeing them survive themselves to breed in the wild. The judgement at least makes clear that this is a trial with the purpose of collecting research evidence. It must be shown to meet its objectives and the ruling does not signify the widespread roll out of brood management. Meeting the objectives over the planned 5 year trial will be judged by a scientific panel reporting into Natural England. Assessing the practicality of artificially rearing and releasing young birds will be challenging in itself and NERF would expect rigorous and exacting measures to be applied. Will the conservation status of Hen Harriers in England be put at risk by interfering with the few nests that we might have? What success will there be in rearing chicks artificially , how will they fair once released into what has been shown to be an unsafe environment and will they live long enough to breed themselves? These are all key questions. The greatest leap of faith, and one at this stage where we have the gravest doubts, is the astounding presumption that the mere existence of brood management trials will “decrease mortality as a consequence of a cessation in illegal persecution”. This seems to be wishful thinking indeed since unlawful persecution is acknowledged to be the greatest current threat! NERF wonders how the trial outcome in respect of the first objective, the “social science” bit, will be assessed and reported on with any degree of accountability. To date the grouse shooting lobby have failed to acknowledge cases of “missing” satellite tagged young birds as being anything other than due to natural causes or tag failure, when all the evidence points to a significant proportion being the victims of illegal persecution. If, as suggested, attitudes towards nesting or wintering birds might change as a result of a brood management trial then why not deliver that change here and now? Must we wait another 5 years of trials during which yet more Hen Harriers will meet an untimely end? We wonder what the projected cost to the public purse will be of not just the trial itself but also the possible subsequent wider evolution of brood management when the principal beneficiary appears to be the economics of the private grouse shooting industry. This entry was posted in NERF Statement and tagged Birds of Prey, Brood Management, Hen Harrier, Missing Hen Harrier, Raptor Monitoring, Raptor Workers on 21/03/2019 by raptorforum.